A pretty handpainted invitation featuring pink gerbera daisies and peonies. The bride requested hot pink daisies and we intensified the color with a touch of raspberry sparkle to highlight the center of the acrylic daisy. 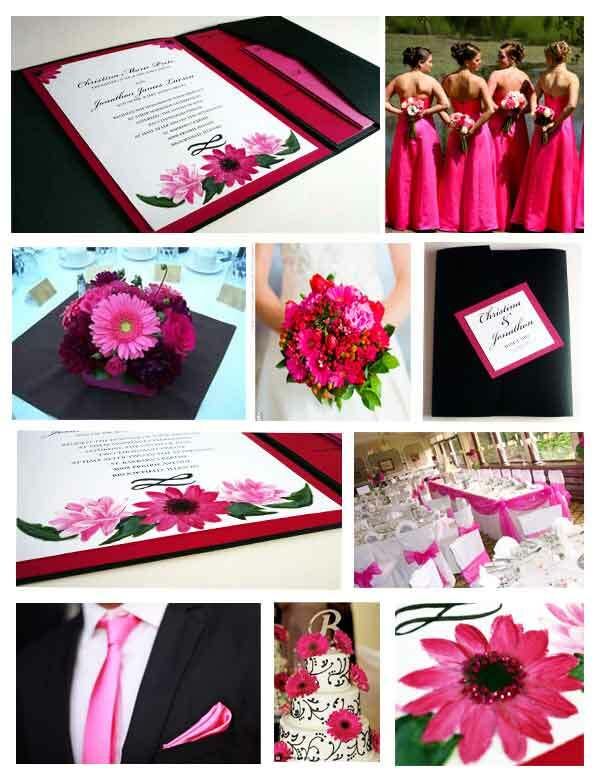 The floral design was added to the bold pink and black color scheme to add a romantic flair. The insert cards were done in two shades of pink to add another pop of color. Initially I was not very certain about what I wanted; I knew my color scheme and I saw things that I liked. However, I really did not know how to bring everything together and describe exactly what I envisioned. Diane showed me a variety of samples of her work and offered ideas and from there I was able to narrow it down to a wonderful invitation design! Diane was patient with me the entire time and made sure I was shown multiple options before selecting the final product. Diane brought the “inspiration” and creativity that I did not have! Thank you, Diane! I am forever grateful for your hard work. I am still getting compliments on how beautiful my invitations, programs and menus were. I just wanted to say a heartfelt thank you to for all your help with our wedding invitations, thank you cards and table cards. I am so glad I found you before I tried to do it all myself. I never could have dreamed of a lovelier invitation to set the tone for an elegant, intimate wedding. You saved me so much time with your suggestions and creative ideas! All our guests were commenting on how beautiful the invitations were! 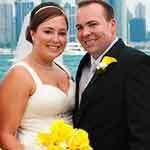 I am sending you a photo of Frank and I on our big day so you can see the smiles you helped put on our faces. Thank you again for going the extra mile to make our wedding absolutely perfect. My husband and I enjoyed working with Diane. She was very patient and listened to all out needs. We gave her our color theme and told her that we wanted orchids incorporated into our invitations and she did the rest. Diane knew I wanted simple yet pretty and Starglow did that times 10. She made it incredibly easy for us to send them out. Everything turned out beautifully and I couldn’t be happier. From the time the invitations were sent out to the actual wedding, I received so many compliments on them. People were still complimenting them to me on the wedding day. After checking around I felt that Starglow was the best in quality, design and style of the all the invitations I had found. Diane gave me advice which saved me lots of time. The theme she helped create not only added a personal touch for me, but was a huge hit with my guests. They raved about the invitation, the programs and the menus. I would refer Starglow to any bride. Starglow Studios created my wedding invitations, programs, favors and menus. Diane custom made a special heart design for us. It was beautiful and unique- which is just what I wanted my wedding to be. I received so many compliments on the invitations. People actually wrote comments about them on the response cards and even mentioned them to me in the receiving line! I was so pleased with her work I used Starglow for the birth announcements of all three of my sons. Each time I wanted something different and each time I was more than pleased with how creative and special they were. Since then, I have used Starglow Studios for baptisms and other events. They have all been works of art!